Privet (Ligustrum spp.) is a tall shrub often planted as a privacy hedge. Growing 15 to 18 feet tall, it is usually trimmed to a more manageable height. Gardeners appreciate the privet hedge for its fast growth and full habit. To maximize growth and fullness, it is sometimes necessary to fertilize privets. Plant privet hedges in full sun in moist, well-drained soil. Though not picky about soil, adding compost provides natural nutrition and improves nutrient transfer from fertilizer to plant roots. Once established privet hedges need to be watered only during prolonged drought. A privet hedge's need for nutrition is not extraordinary. Privets can get nutrients from soil, decomposing mulch, leaf and twig matter and fertilizer from adjacent lawns. 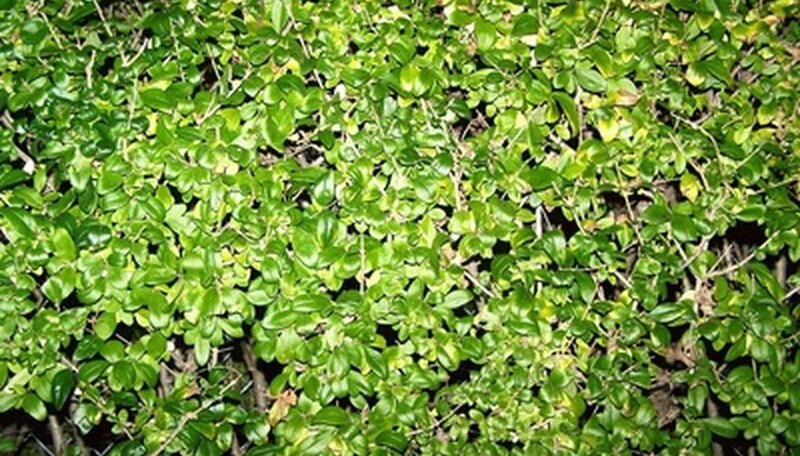 A privet hedge only needs to be fertilized if it shows signs of malnutrition, such as yellowing leaves or reduced vigor, or when faster growth is desired. Fertilizer for privet hedges should be approximately balanced. Balanced fertilizers contain roughly equal amounts of nitrogen (N), phosphorus (P) and potassium (K). N-P-K ratios should be about 15-15-15 or 30-30-30. Apply fertilizer in spring to encourage abundant spring growth. Gently scratch fertilizer into the soil or replenish mulch on top of the fertilizer to keep granules from washing away during rain and irrigation. If faster growth is desired, apply again in late summer or early fall. In hot climates, such as Florida, privets can take three applications per growing season. Use fertilizer sparingly on privets the first year after planting. Too much nitrogen encourages leaf growth that the roots cannot yet support. The tender, leafy growth is easily damaged in hot summer sun and drought. Don't fertilize privet in mid- to late-fall because fresh, late-season growth can be damaged by frost.